The Create a Plan & Set Goals section will help you learn about the importance of setting goals. Are you clear about your skills, interests, and values? If not, you need to assess yourself before you set goals. Do you know about occupations that fit you or do you need to explore careers? If you are ready to set your own career goals, then you are ready to find out more about creating a plan and using these exercises. What are goals and career plans? Goals are things you want to accomplish or change in your life. It takes effort and organization to make changes in your life. That's why you can use a career plan. A career plan helps you keep track of your goals. A career plan also helps you think about how to accomplish your goals. Your plan will also help you think about who can help you. Don't think you need a career plan or goals? In the New World of Work, you learned that employers like to hire people who take charge of their careers. Also, you might reach the point in your life where something isn’t quite right. Maybe your job doesn’t pay well enough. Maybe you want to learn a new skill. Maybe you feel stuck. The good news is that you can change your career, and your life. Make the changes that you want and find the help you need by using the planning and goals information in this section. You can make more money and advance. 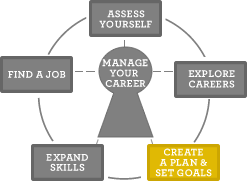 Create a Career Plan (pdf) and follow it. Be attractive to employers. Think about how to Expand Your Skills.